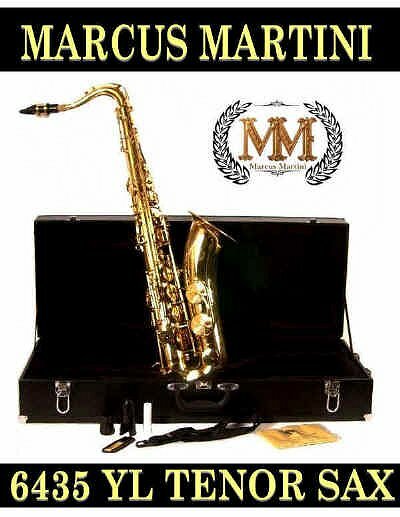 Marcus Martini 6435YL Engraved Tenor Saxophone Description: Specs: Key of Bb, Large Engraved Brass Bell, Injection Molded Keys, Premium Leather Pads and Springs,High F# Key, Laquered Finish. Accessories: Tenor Saxophone Case, Tenor Sax Mouthpiece, Cap and Ligature, Sax Strap, Rico Reed and a Saxophone Care and Maintenance Kit. 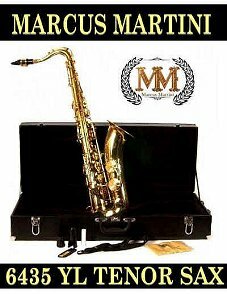 The Marcus Martini 6435YL Saxophone is a great choice for beginners looking to start out with an excellent quality student tenor saxophone. Great balance, tone and finish make this tenor sax a winner! Select from 3, 6 or 9 month rental options. Rental goes to monthly billing at the end of the up front rental period you select and you may return at anytime. There is a purchase option with every rental which allows you to apply up to a specific amount of paid rental fees toward the purchase of your instrument. There are economical advantages to paying for a larger block upfront and those options and discounts may be reviewed above. We can ship your Deluxe Marcus Martini 6435YL Tenor Saxophone Rental anywhere in the USA! Order Online Now. Click here to hear a Tenor Saxophone Sound Sample.